From time to time, I add to my freight car fleet, even though I have more cars already than can populate the layout, by a factor of probably four. why would I do that? Thoughts on this question are the content of this post. I have written a few comments previously on this subject. For example, in one post in 2011 I discussed the tension between acquisitions for collecting and for operating (see it at: http://modelingthesp.blogspot.com/2011/08/collecting-vs-operating.html ). 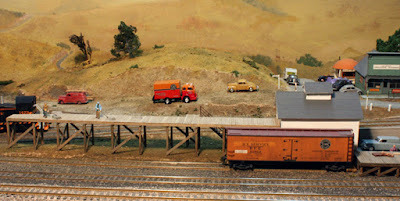 I expanded on those remarks in 2014 with some more general discussion about how one might evolve or “home in” on a car fleet for a specific layout plan (that post can be found at: http://modelingthesp.blogspot.com/2014/05/moving-from-collecting-to-operating.html ). Here I want to return to these topics with a little bit of additional perspective. Previously I divided freight car acquisition motivations into two kinds, collecting and operating. But I think there are really two more aspects. The first of these, for simplicity, can be called “fun.” I know I have occasionally bought a car just because I liked it. It wasn’t needed for operation and didn’t add to any particular collection (unless the entire car fleet is regarded as a collection). Especially with ready-to-run cars (R-T-R), getting the full paint scheme without work (other than weathering, maybe changing couplers, fixing the reweigh date, etc.) is just too tempting. The car itself is shown in the photo below. The main job here was to change the original kit car body from having five side sheets to the left of the door opening, and eight to the right, to the correct SP arrangement of, respectively, four and six sheets. You can click to enlarge this view of the complete and weathered model. Another example might be the Mathieson tank project described earlier, a car I built specifically to see how well the Tichy dome would work in this application. The modeling is described at the following link, which was the concluding post on the project: http://modelingthesp.blogspot.com/2015/12/modeling-insulated-tank-car-part-2.html . Of course, I would like to think that most of my freight car acquisitions represent operating needs (and many actually do), and I don’t mind some of the new cars representing a collecting instinct, such as wanting to have one car from each modern class of SP 12,500-gallon tank cars. As shown in several prior posts, I am almost there for that goal, though of course operations do not demand one car of each class, only a sufficient number of SP tank cars. And so it goes. 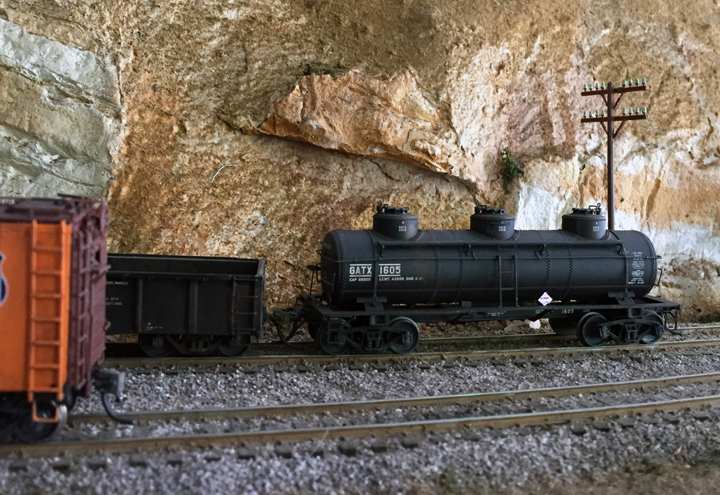 I continue to be very freight-car oriented in my modeling efforts, whether to identify cars to build, or to carry out various car modeling projects, or to operate the cars on my layout. 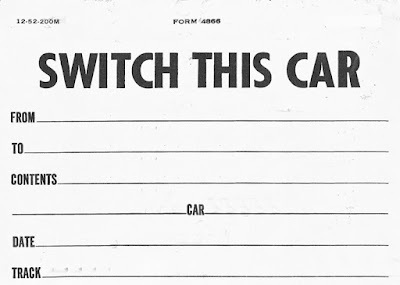 But there are definitely times when it is helpful to remind myself of exactly why I want to add a particular car: is it fun, or an interesting challenge, or does it extend a collection, or do I need it to operate? The answer sometimes causes me to re-evaluate a purchase (or a disposal). In 1902 the Southern Pacific, under Harriman administration, acquired the Cananea, Yaqui River and Pacific Railroad, and began construction near Guaymas, Mexico towards Guadalajara. In 1909 this and other properties, such as the Sonora Railway, were consolidated into a new corporation, the Southern Pacific Railroad Company of Mexico (often referred to as SPdeMex from the Spanish name, or by its reporting marks, SPdeM). It was not until 1927 that the 1095-mile line from the border at Nogales to a junction with the National Railways of Mexico (NdeM) at Guadalajara was completed. Much of the equipment of the SPdeM was handed down from parent SP, locomotives and rolling stock in particular. 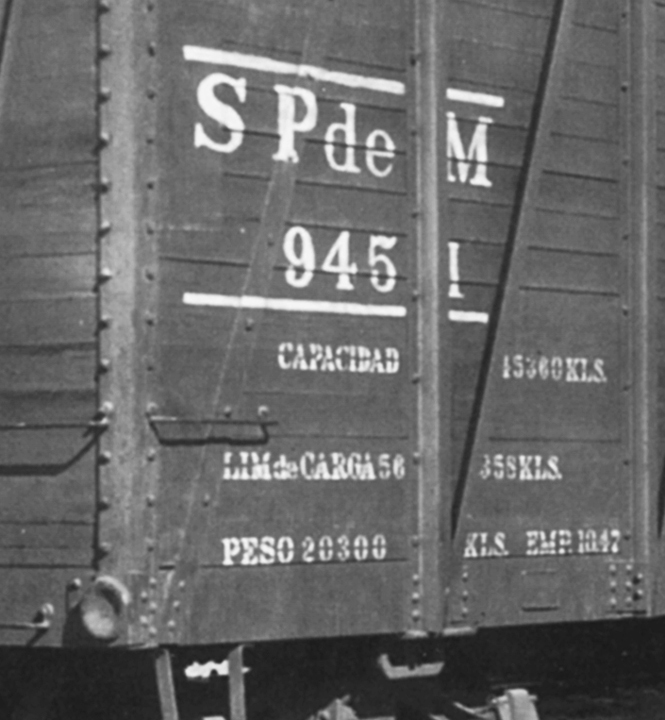 The line was never very profitable, and in 1951 SP decided to sell it to the Mexican government. The sale was completed on December 21, 1951, and the entity which took over the railroad was named the Ferrocarril del Pacifico (Pacific Railroad). 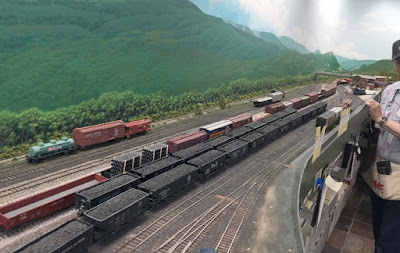 Not only the railroad, by then totaling 1227 miles, but all the facilities, supplies and equipment were included in the sale, and SP even added a number of older freight cars and locomotives, not SPdeM property but surplus on the parent railroad, to enhance the sale. 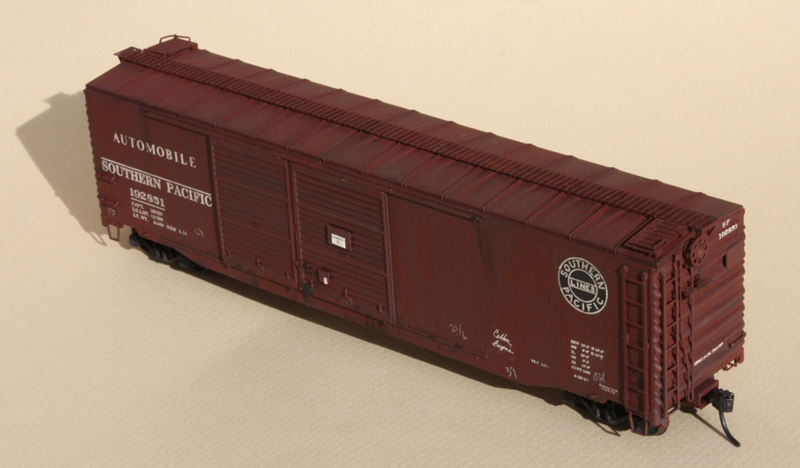 As a 1953 modeler, this changeover has implications for my freight car fleet. Although the new F del P (or FCP, as it soon became) naturally began to repaint and re-letter locomotives and rolling stock, understandably this took time. Thus I could certainly justify a freight car lettered SPdeM on my layout, but might like to show a “patched“ or partly relettered F del P car instead. What did these look like? Shown below is a former SP Class B-50-13 box car, relettered for F del P by the simple expedient of painting out the “S” in SP and replacing with “F del.” All other lettering items, including car number and all dimensional data, are unchanged. The photo was taken a Guadalajara, Mexico on April 15, 1952 by C.W. Witbeck (Cyril Durrenberger collection), Note that this is not a former SPdeM car, but clearly was one of the SP cars included in the sale, because the initials being repainted were clearly SP, not SPdeM. To see this repaint more clearly, here is an enlargement of the reporting mark area of this car. Note also the reweigh data replacement. This photo was taken at Guaymas, Mexico in 1958 (Arnold Menke collection). If any original SPdeM cars remained by my modeling year of 1953, they had one of several paint schemes, of which the photo below is just one example, but this would be the appearance I would try to achieve if I did any SPdeM cars for my car fleet (detail of J.T. Haug photo, courtesy CSRM). This is the background of the change in the former SP Mexican railroad property, which I want to capture in any Mexican cars I would model that are appropriate for 1953. More on modeling in a future post. In recent months, I have posted a series of descriptions of route cards, on the basis of several groups of prototype cards provided by Ralph Heiss and John Holmes. These can be found via the most recent in the series, which is at this link: http://modelingthesp.blogspot.com/2016/08/route-cards-part-15-additional-examples.html . I find the prototype cards intriguing, and have been thinking about whether and how I could use them in my layout operating scheme. One idea occurred to me immediately, partly as a response to a perceived problem in past operating sessions. Here is the problem. Cars which have an intermediate movement, such as confiscated empties or off-spot cars needing to get a final spot, don’t directly have instructions in the usual cycle of Waybill — Empty Car Slip. I have used agent messages in an effort to clarify to crews what is needed (see for example my previous discussion at: http://modelingthesp.blogspot.com/2015/06/operating-with-agent-messages.html ). But as I said, crews often seem to misunderstand (or incompletely understand) this kind of car movement. 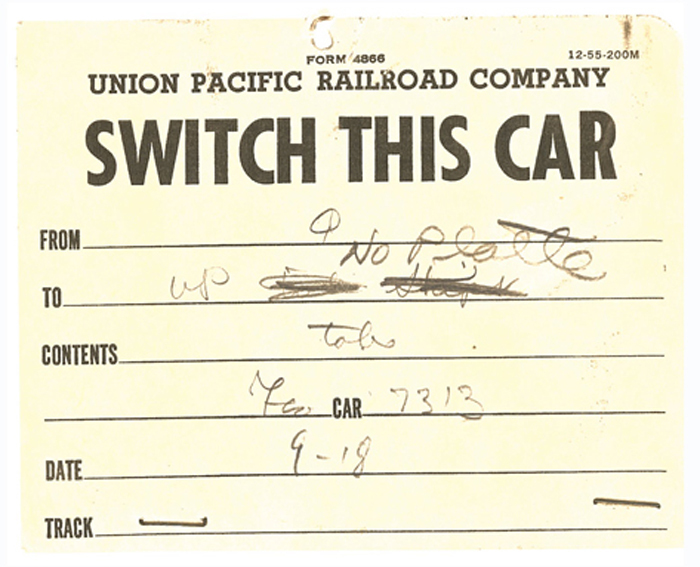 A possible solution was suggested by one of the route cards, namely this one from the Heiss collection, a Union Pacific card. I showed it in one of the prior posts about prototype route cards (you can see that discussion at: http://modelingthesp.blogspot.com/2016/07/route-cards-part-14-still-more-examples.html ). This could obviously be used as directions to a freight crew, for a non-waybill movement. My procedure was simply to clean up this image with a clone stamp in Photoshop, including removal of the UP name, then discard color information in the image to convert the file to black-and-white. I then re-sized it to match my waybill size and shape, at 2.5 x 3.5 inches, and the resulting card image is shown below. You can note here the somewhat manila color of the cards I printed. 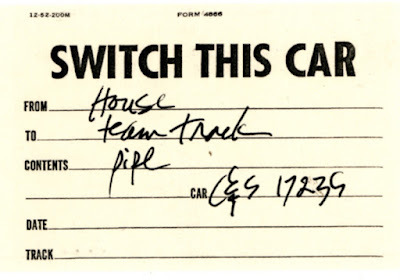 The directions are to move an off-spot car, GS gondola C&S 17235, from the house track to the team track. My experiments so far with this card seem to work well. I will continue to explore its use in future operating sessions, and am also considering other uses for route cards in operation. I have discussed this topic before, but want to add information in this post about a useful source of information for placarding. The question always is, what placard goes with what cargo? The appearance and use of prototype placards, emphasizing my own modeling era of 1953, were discussed in a previous post just on that topic (at: http://modelingthesp.blogspot.com/2012/03/tank-car-placards-prototype.html ). I followed that post with a discussion of model tank car placards (see it at: http://modelingthesp.blogspot.com/2012/03/tank-car-placards-modeling.html ), and updated with more information in a following post (available at: http://modelingthesp.blogspot.com/2012/12/tank-car-placards-more-on-modeling.html ). 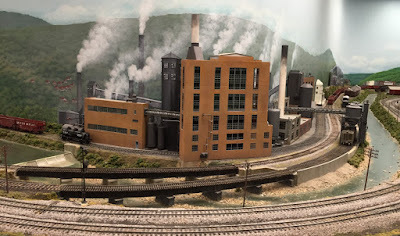 Finally, I wrote a post to call attention to an excellent work of history for the chemical industry, which readily allows one to know what products were the primary output of which chemical companies (find it here: http://modelingthesp.blogspot.com/2015/10/tank-car-cargoes-reference.html ). 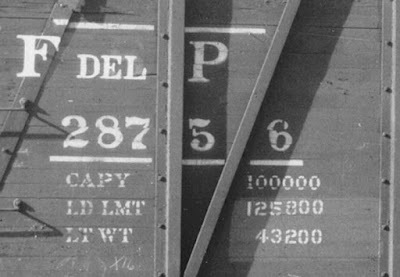 In a number of the foregoing posts, I mentioned one good source of information about which placards go with which cargoes, an appendix to Ed Kaminski’s book, Tank Cars: American Car & Foundry Company, 1865–1955 (Signature Press, 2003). But I realize not everyone wants to buy that book, and might like a less expensive source of comparable information. Here’s a suggestion. 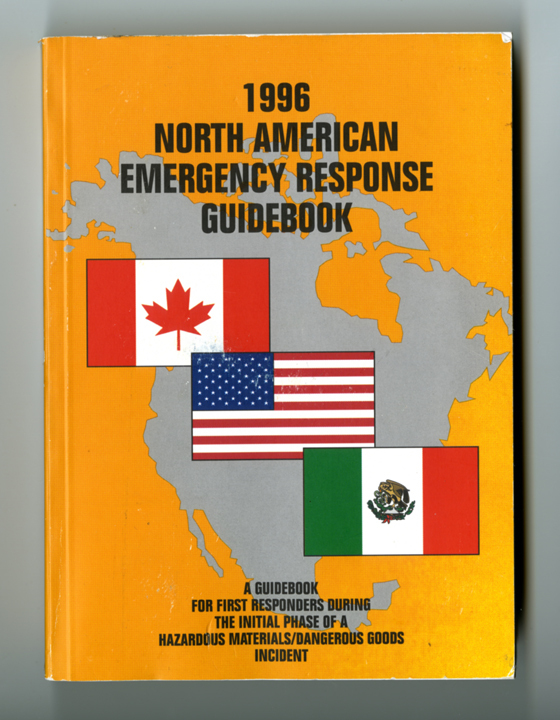 For a number of years, a book has been published annually as a guidebook for emergency responders (firefighters in particular, but also police and hazmat people). There was a North American version, published by the appropriate agencies in Canada, the U.S. and Mexico, and today there is a very similar international one. All of them use United Nations nomenclature and contain the same information about hazardous substances. These are readily purchased on-line, at prices ranging from about $3 to $8, the lower price being a pocket-size but complete book. Here is a link to just one of many available sources: http://www.labelmaster.com/shop/erg/?gclid=Cj0KEQjw_qW9BRCcv-Xc5Jn-26gBEiQAM-iJhU_kQQAJMovXbU-1fDSnr57FQruDp2ZcRKKkwAElU-gaAvyf8P8HAQ . The value here is that each potential cargo is identified as to its primary danger. A cargo may, for example, be flammable and poisonous, and the latter is likely to be the primary danger, thus identifying the placard needed. Or a cargo may be flammable and also corrosive, and the most dangerous of those two characteristics will determine which danger is placarded. For the post-1981 modeler, the placard style contains the four-digit United Nations identifying number, and a variety of color coding is used to quickly identify categories of risk. At the other extreme, pre-1960 modeling has to accommodate a smaller number of risk categories and placards, with not entirely consistent colors or names. (For more about the placards of both of those eras, as well as placards of the 1960–1981 period, see the first post cited at the top of the present post). Just to offer a single model example, I will choose a Tangent three-compartment car. I posted an earlier summary on how multi-compartment tank cars were waybilled (see it at: http://modelingthesp.blogspot.com/2016/01/waybills-part-48-multi-compartment-tank.html ), and this model would be handled that way too. Since in this case all three compartments contain liquids whose primary danger is that they are flammable, which I looked up in the book shown above, the placard is of that type. Though most guest operators on my layout do not take much notice of tank car placards, I like to make them accurate for my own satisfaction. With a range of model placards readily available (see for example this post: http://modelingthesp.blogspot.com/2012/12/tank-car-placards-more-on-modeling.html ), this is easy to do, requiring only the information about cargoes. That is the value of the book shown above: you can quickly and easily determine which placard should be on particular tank car models. The well-known HO scale layout of David Parks, called Cumberland West, models the B&O and Western Maryland in Maryland and West Virginia. 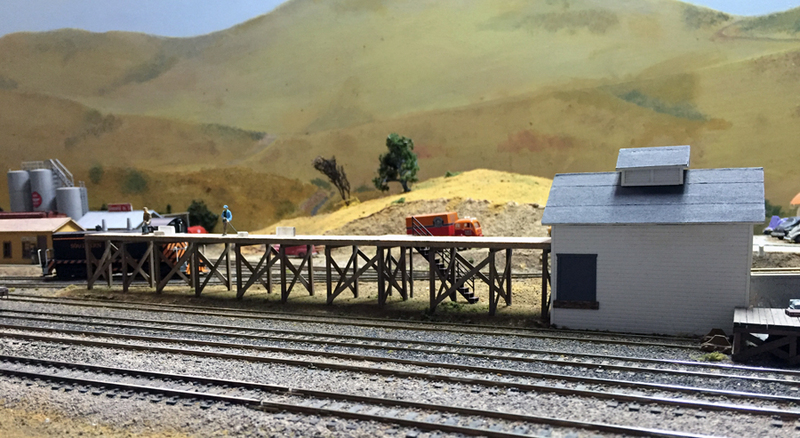 The layout website contains instructive details (see it at: http://dpcw.borail.net/ ), and there is also a separate website for the technical side of this very large (1200 square feet), complex and sophisticated layout (that site is at: https://sites.google.com/site/westerncumberland/home ). 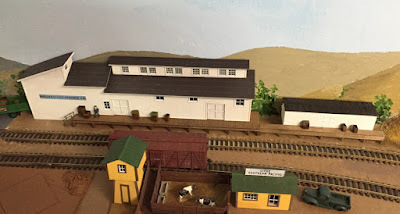 There is also a YouTube video tour which gives an excellent impression of the overall layout (here is a link: https://www.youtube.com/watch?v=iceAOV2QVfY ), though it is a video from 2012, and layout scenery continues to be completed. I had the privilege to be invited to an operating session recently, which is the subject of this post. 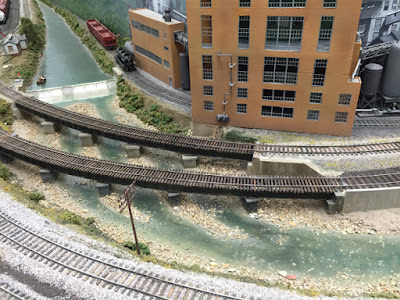 The layout has extensive trackage and operating complexity for both WM and B&O, and in principle both railroads can be run at the same time, but aisle space simply is in too short supply to make that practical. Operating sessions accordingly are for one railroad or the other. I had operated at David’s before, but coincidentally always for Western Maryland sessions. This time it was for the B&O portion, so I was intrigued to see how operations worked on that side. My assignment was yardmaster at Keyser, West Virginia. The yard switch crews worked for me, so my main job was to understand upcoming scheduled and extra trains. Tower operator Sam Romerstein was a great help, as he knows the layout well and could interpret for me when I didn’t grasp the paperwork. Below is a shot early in the session (switcher engineer Andy Schnur is at right), during an unusual time when we were working a merchandise train in the yard. It did keep us busy. 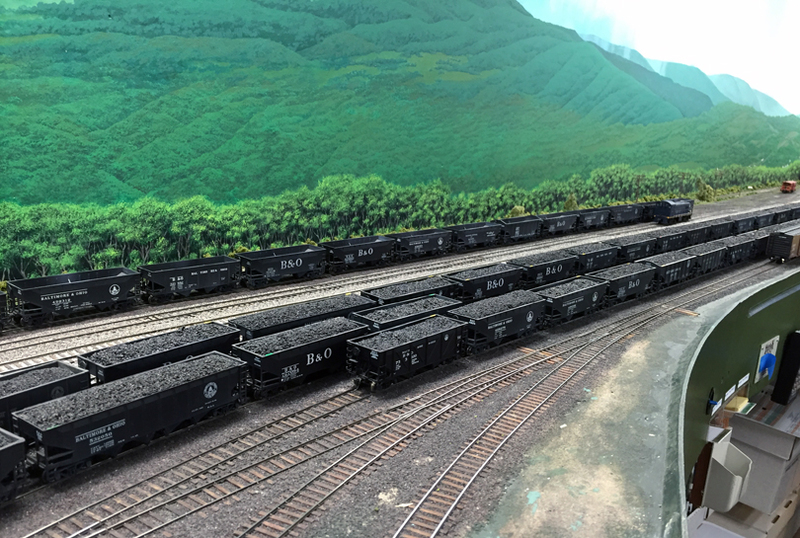 When there weren’t loaded coal trains to make up, each with its own mix of six grades of coal, we handled trains of empties in the other direction. One of the best things about the layout is the visuals. 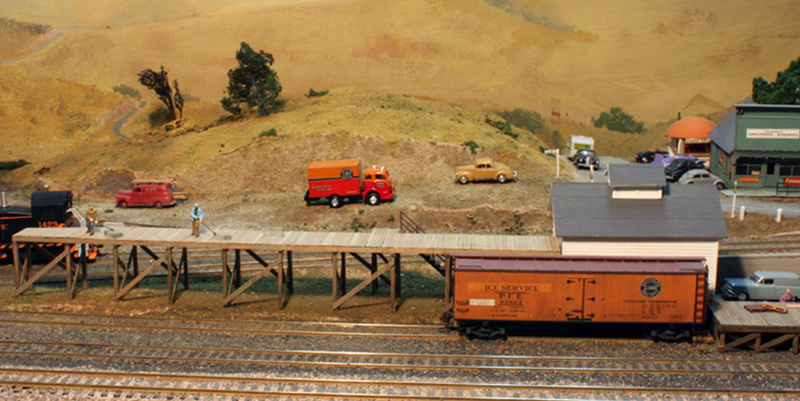 The backdrops are superb, painted by noted railroad artist Mike Kotowski. Among the best scenes is this mine on the WM, shown below; if you’ve spent any time in West Virginia, there is no mistaking this topography. Another scenic treatment I really like is the West Virginia Pulp and Paper plant at Luke, Maryland, also on the WM. It neatly disguises an outside corner of the layout room, and definitely does have all the steam plumes of real paper plants. Luckily, it doesn’t have the smell! This is a great layout to railfan and and great one on which to operate. With both afternoon and evening sessions on the day, it made for a long pull, but I greatly enjoyed it. This is one layout that has always been a pleasure. 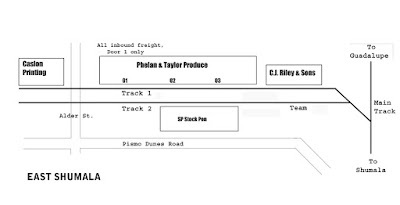 Recently I wrote four posts to present prototype examples of freight car route cards; the most recent contains links to the prior series. It is at this link: http://modelingthesp.blogspot.com/2016/07/route-cards-part-14-still-more-examples.html . The present post contains additional examples, cards sent to me by John Holmes. I appreciate John’s generosity in making these available. I want to begin with an interesting pair of cards, as they are from the same freight car, Milwaukee 14304, and are destined to a Cadillac dealer in Santa Ana, California, named McLean Motors (they unloaded at a team track). 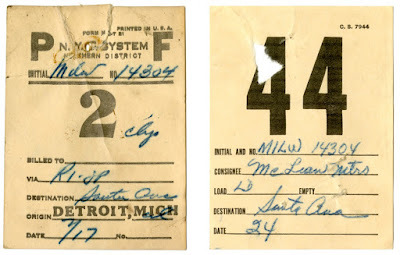 The card on the left is a New York Central card, Northern District, originating in Detroit, Michigan. It shows routing as Rock Island–Southern Pacific beyond NYC rails, which leads me to believe the second card, on the right, is an SP card, likely switching job or district no. 44. MILW 14304 was a 50-foot automobile car (double doors) equipped with auto racks, AAR Class XAR. These two cards are exactly the same size, 3 x 4 inches. Another interesting pair is shown below, The card at left is evidently a Milwaukee Road card and directs the car, MHLX 80093, from Milwaukee to AT&SF, which would take the car to California (again, destination Santa Ana). 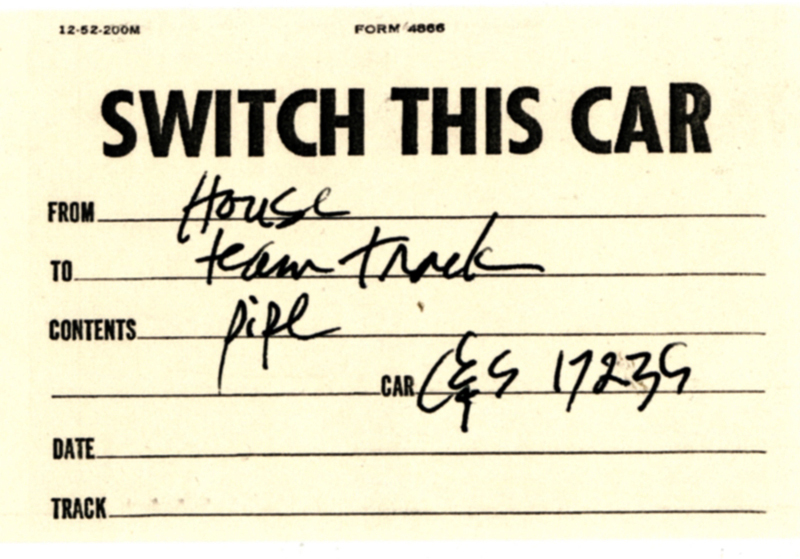 MHLX is a leased Miller High Life car, and the cargo, as the card shows, was beer. On the right is another New York Central card from Detroit, this one coded 5A instead of code 2 as in the above case. The card is preprinted for the line “billed to” as Joliet, Ill., but that has been overwritten with pencil and the word Streator (Illinois?) written in. For these next two cards, we again have an interesting pair from the same car. 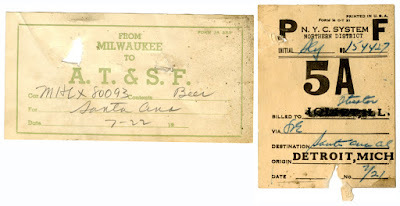 The one on the left is a Missouri Pacific card, applied in St. Louis, to an SP box car, no. 129281, carrying merchandise. It identifies the destination as Pueblo, Colorado. The card at right is a Denver & Rio Grande Western card, interesting with a "red ball" printed in green, probably identifying a priority load. Unfortunately, we don’t have a consignee or cargo description. This larger card is 4.5 x 6 inches in size. All six of these cards are interesting in and of themselves, and give us additional windows into prototype route card practice, when viewed in combination with the several prior posts that showed cards from the Ralph Heiss collection. I recently received another question via email, relating to route cards, as to whether old cards were left on the route card boards, and new cards simply nailed or stapled over them. The answer, from men who worked in yards, is “yes.” As one put it, there was no time to mess around with old cards. This makes, then, an interesting modeling opportunity, to place visibly overlapping or torn cards. The following example is built from a C&BT Shops kit, modified to represent Santa Fe Class Bx-44. You can click to enlarge and see the two route cards on the door’s route card board. The route cards are just small paper rectangles. Here is another model example, a wood-sheathed GS gondola. 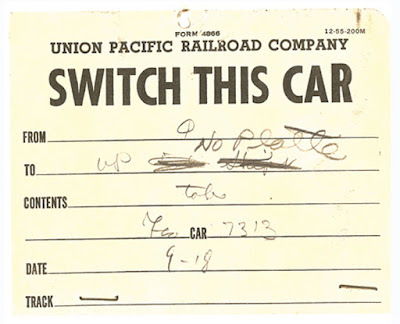 On cars like this, car clerks did not have to locate the cards they were placing, on a particular route board, but could attach them anywhere on the wood sheathing. A location near the left bolster was common. Here one of the cards is represented as being partially torn off and thus not rectangular. 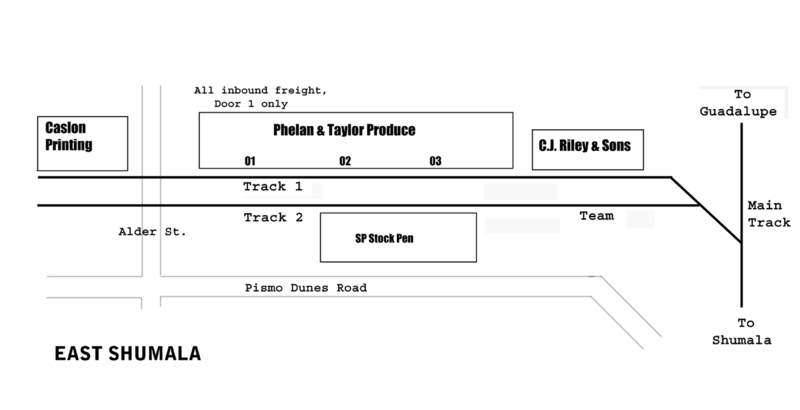 I continue to put representations of route cards on most of my freight cars, based on the observation by both Richard Hendrickson and me that at least 90 percent of freight cars in prototype photos do have the cards (except, of course, brand-new or freshly outshopped cars). I think they add both an interesting detail and a touch of realism. 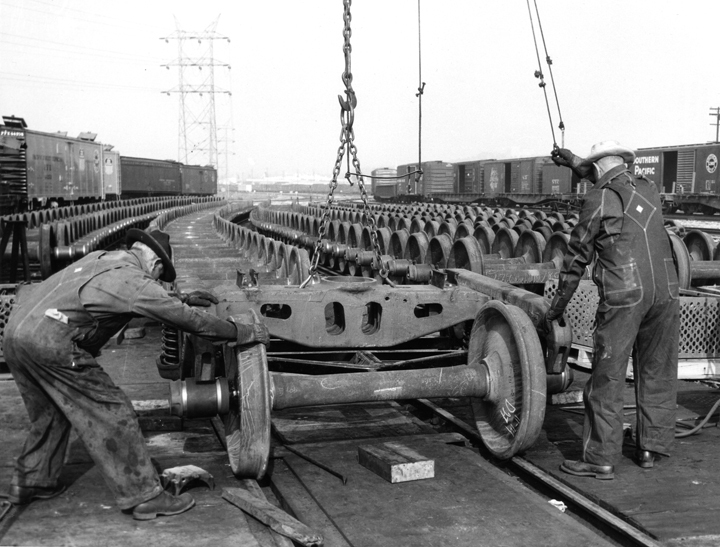 I have written several prior posts touching on railroad wheels. The principal one can be found at the following link: http://modelingthesp.blogspot.com/2016/04/truck-and-wheelset-modeling.html . It emphasized the point that prototype wheels do not have very thick treads, compared to most model wheels; the prototype is a bit over 5.5 inches thick, which in HO scale is only 0.063 inches. 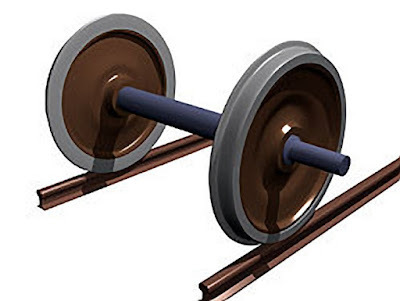 What we call “semi-scale” wheels in HO are 0.088 inches (called Code 88), and older “standard wheels” in HO scale are 0.110 inches (Code 110), or about double the prototype size. I wrote a post recently about production of cast wheels at Southern Pacific’s Sacramento General Shops. (You can read the post at this link: http://modelingthesp.blogspot.com/2016/07/southern-pacific-wheel-production.html .) 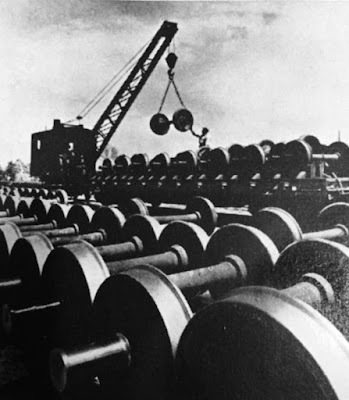 Once wheels had been cleaned and had their dimensions checked, they were pressed onto axles with large hydraulic presses, thus creating what is called a wheelset. Here is a drawing of a wheelset, from the Wikipedia entry (at: https://en.wikipedia.org/wiki/Train_wheel ) about railroad wheels. It makes the point about the prototype thickness and overall appearance very clearly. Note also here the prominent axle ends, on which the bearings rest; these are called journals. They are virtually identical for both solid and roller bearings. When wheelsets were produced at central railroad shops (or purchased from manufacturers), they had to be transported to various outlying shops and yards where wheel replacement might take place. This photo from a 1953 Southern Pacific Bulletin (employee magazine) shows wheelsets being loaded onto a wheel car for this kind of transportation. A wheelset weighed about 2200 pounds at this time. The appearance of the wheels is quite clear, along with the journals. Many photos of wheels and trucks confirm the look of the drawing shown at the top of this post. 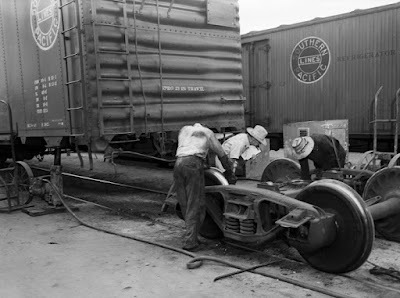 Below is a Southern Pacific photo of a wheel change in progress. The car has been jacked up on its bolster and the truck rolled out for service. The proportions of wheel tread to the 33-inch diameter of the wheel are evident. An even more dramatic photo is this view at the Pacific Fruit Express Los Angeles Shop (alongside SP’s Taylor Yard) of workmen assembling 70-to trucks for the R-70-12 mechanical refrigerator cars then in production. The journals have roller bearings already installed, but the wheelsets are dramatically portrayed. Note the hollow cast-steel bolster also. These are pedestal sideframes. The overall message should be clear: prototype wheels are rather slender, compared to our model wheels, whether we use “standard” Code 110 or “semi-scale” Code 88, and in addition, the prototype wheelset has very prominent axle journals. These discrepancies don’t matter much under a freight car, but when a truck or wheelset is seen by itself, they become awfully obvious. At the top of this post is a link to my earlier post that showed one particular kind of model wheel, from Tichy set 3004, which can serve as an accurate prototypical wheel if one chooses to represent in model form, scenes like the ones shown in this post. There has been extensive writing by me and others about SP tank cars and their modeling. 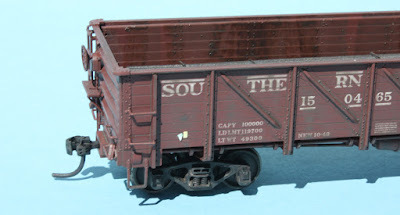 For years, one issue has been decals, because there were none of correct size characters, let alone correct content, in HO scale to do these tank cars. Accordingly, I created artwork to do so, with the intention to include the ability to model both black cars with white lettering, yellow gasoline cars and silver diesel fuel tank cars with black lettering, and even the “aluminum end stripe” diesel fuel cars, which required both black and white lettering. Just to illustrate, the photo below shows several SP tank car paint schemes, with the aluminum end-stripe example in the foreground. You can see why both black and white lettering are needed in different parts of the car. 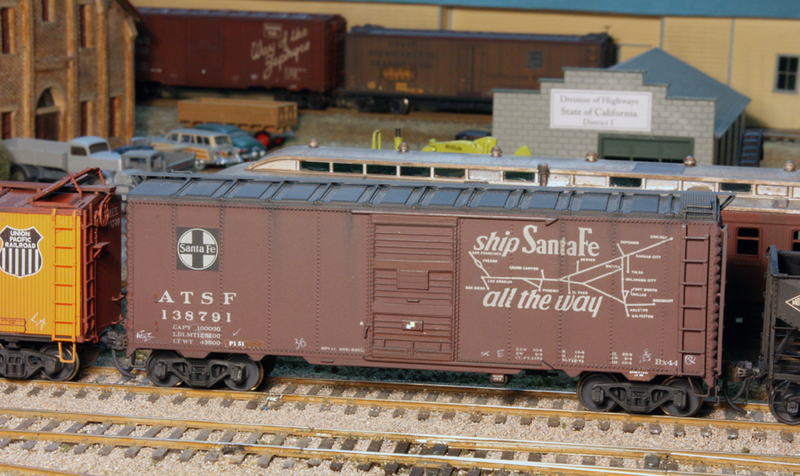 This model was lettered with decals from my artwork. 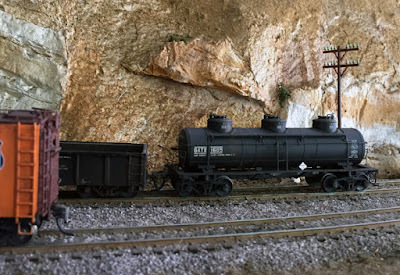 Incidentally, back in 2011 I posted a description of how to model these kinds of SP tank cars from the Athearn kit in HO scale, which can be found at: http://modelingthesp.blogspot.com/2011/05/modeling-sp-tank-cars.html . One of my prior posts described that original SP tank car artwork I did for HO scale decals, which were then offered for sale by Jerry Glow as part of his large decal line (see that post at: http://modelingthesp.blogspot.com/2011/05/sp-tank-car-decals.html ). >>Here are the new decals. All decals are available in all scales and in 6 packs. Numbers below are HO, add N for N scale, S for S scale and O for O scale. Other scales, send an email request. Single decals are: HO $4, N $4, S $5, O $6. All are in stock. I am delighted to have these decals available once again, and am also delighted that other scales can now benefit from this artwork. Many prototype railroads used a term for spotting cars at industries, the “sure spot.” This meant spotting the car at a specified location, such as on a particular track within an industrial complex, or at a particular loading dock, or alongside a particular loading door. 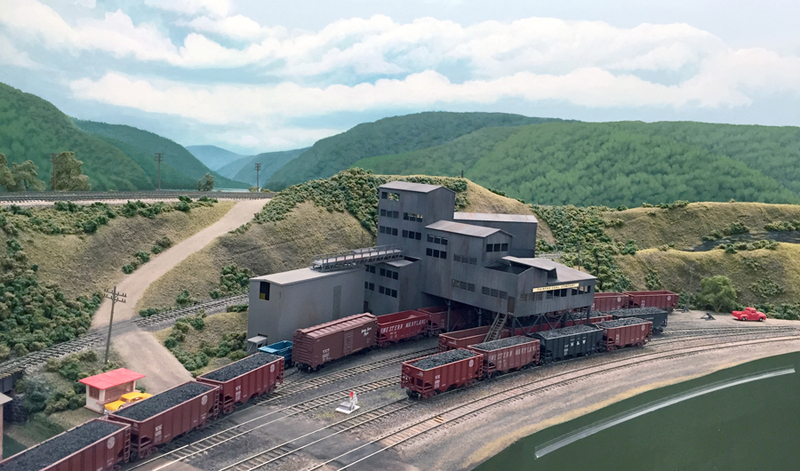 Sometimes this would be an obvious requirement, such as placing tank cars to be loaded alongside a loading rack, or placing a hopper of coal over an unloading trestle. But sometimes it is less obvious, when a particular warehouse door is specified for certain arriving loads. I have implemented sure spots to some extent in my layout operations, and in this post I describe a few of them. One way to specify them for the benefit of operating crews is to provide town maps (or in later eras, SPINS documents or equivalent). I alluded to this usage in my column in Model Railroad Hobbyist that was about timetable construction. That column was in the issue of MRH for October 2014, and like all issues of MRH, it can be downloaded for free by anyone at the MRH website, www.mrhmag.com . Here is an example of one of my town maps, for the switching district of East Shumala (click to enlarge). 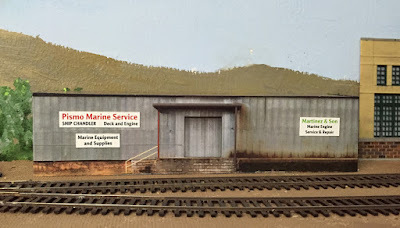 The storage shed at right, with its door equally spaced (for 40-foot reefers) with the two doors on the main building, is only used during high shipping season. Thus empty reefers are normally spotted at doors 1 and 2. The foreground stock pen is a single-spot example. Many of my industries have a single door or a single spot, and don’t require any specified sure spot. A good example is Pismo Marine Service, a ship chandler, at Santa Rosalia. There is only one door and one short loading dock, and clearly only one car spot. The building also hosts Martinez & Son marine engine service and repair. Some spots are not immediately obvious. My ice deck is supplied from an ice house which is primarily a storage house, and the only ice produced here is consumer ice. To be able to ice reefers with thousands of pounds of ice per car, the facility receives ice shipped in. This shipping is accomplished with PFE Ice Service cars, and they have to be spotted at the receiving door. That door is shown in this early-morning view, on the side of the ice house. Often during an operating session, one of my Ice Service cars will stand here throughout the session, but from time to time, an empty Ice Service car is to be picked up, or else an inbound load of ice has to be spotted at the receiving door. Cars being iced, of course, are spotted alongside the deck, not at the receiving door. Here is a photo of an ice delivery car on spot. The variety of switching requirements with sure spots adds complexity and thus interest to operating sessions, as well as reflecting a range of prototype needs and arrangements. I have assigned sure-spot designations for all the industries on my layout for which they make sense. In a previous post, I explained in a simplified way how in-transit shipment privileges worked, and what prototype transit waybills would look like. (See: http://modelingthesp.blogspot.com/2016/05/waybills-part-50-in-transit.html .) The example I showed in some detail was that of milling wheat into flour, a case in which essentially all the wheat moves onward to destination in the form of flour. The same situation would obtain with any commodity that is merely stored in transit, rather than being processed or altered before moving onward. But when in-transit processing changes the quantity of material to move onward, there are additional issues. This is an aspect of the story that I didn’t include previously, partly for the sake of brevity. In freight operations literature, the change in quantity is what was called “transit loss.” Imagine a box company which mills rough lumber to make box shook. (“Box shook” is a bundle of parts for assembling a wooden box, with the box to be assembled at its place of use.) In the process of milling the lumber, a certain amount is converted into sawdust and cut-offs, and that part of the original shipment will not be shipped onward. How is this accounted for? Essentially, the charge for that part of the original shipment is removed. One example of this kind of adjustment is shown in a page from the Southern Pacific station agent’s “rule book,” called Forms 39.1, which were issued to all agents and regularly updated. The resulting volume was about two inches thick. I was able to borrow a copy of one of these books and examine several parts of it, and I show here a page from the in-transit section, showing this kind of adjustment for transit loss. (You can click on the image to enlarge it.) The shipment was of lumber from Ashland, Oregon, to Valley Box Company at Castella, California, then after milling, onward to a consignee at Redlands, California. Note that this is not a waybill, but is a document enabling a refund of overpayment on shipping charges. It does illustrate the accounting viewpoint on transit charges. The 20 percent loss shown may have been a standard for this kind of milling, or it may have related only to this particular company. The loss just described is different than a consistent and predictable loss, such as the loss in milling of wheat, set in tariffs as 1 percent, or from drying corn, of 10 percent. This means that if a shipment of 40,000 pounds of corn is received at a processing plant to be dried, that plant is only entitled to claim transit privileges on 90 percent of the inbound load, or 36,000 pounds. But losses such as cutting lumber into another form, as in the box shook example above, are not consistent from case to case and can be called out separately on a waybill reconciliation document. Documentation was issued by regional Weighing and Inspection Bureaus for transit charges, based on reported weights. Here is an example, from the Station Agent’s Blue Book, as described in the prior post in this series (link at top of the present post). Note that the standard 1 percent loss for wheat is indicated in the column in the upper portion, just right of center. The Western Weighing and Inspection Bureau or WWIB did not cover, as might be imagined, the Far West of the United States, but the western portion of the Midwest. The bureau covering the Far West was called the Transcontinental Freight Bureau or TFB, which is the abbreviation I use on my SP waybills. 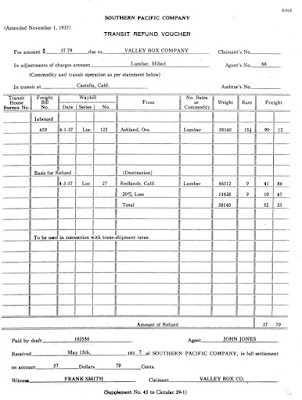 Individual railroads issued tariff documents setting out the allowed losses, of the kind just described, along with lists of commodities which could claim in-transit privileges, procedures to be followed, and accounting practices. Thus the modeler wishing to achieve an accurate description in waybills of a particular railroad’s practice would need to have access to an era-specific tariff publication from that railroad. 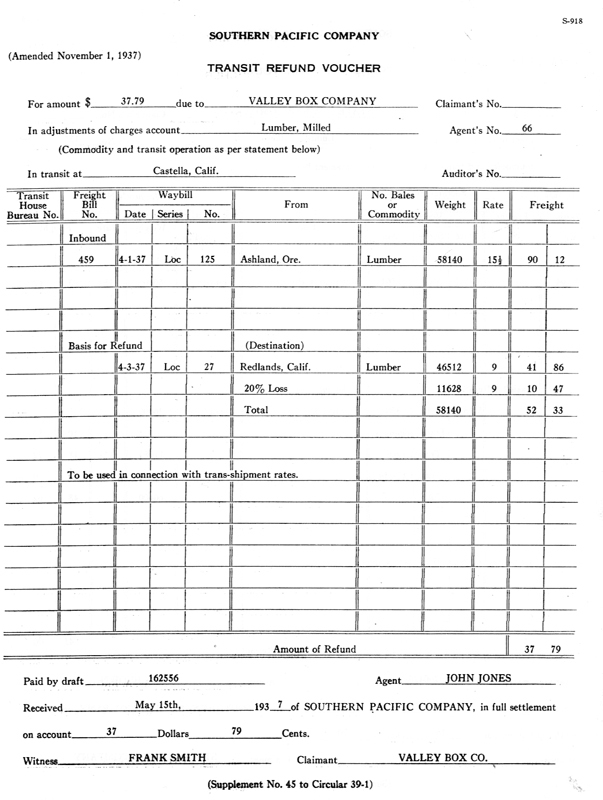 Most of us will be comfortable with a more generic form, and I will turn to a model version of an in-transit waybill in the next post in this series.